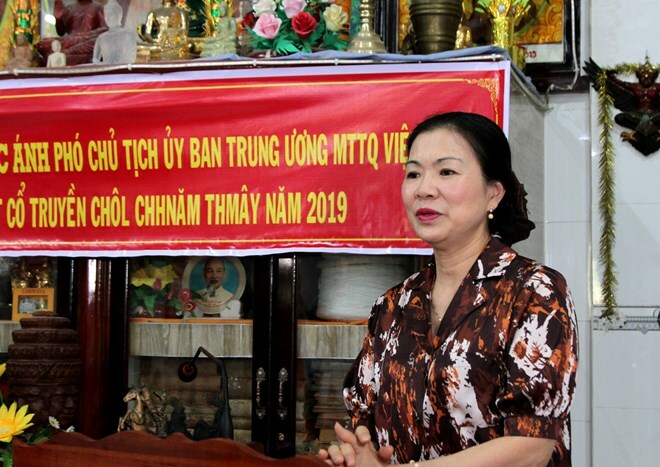 Bac Lieu (VNA) – Vice President of the Vietnam Fatherland Front (VFF) Central Committee Truong Thi Ngoc Anh visited the Mekong Delta Bac Lieu province’s Patriotic Clergy Solidarity Association on April 11, on the occasion of the Chol Chnam Thmay, the traditional New Year Festival of Khmer people in the south. Anh expressed her delight at the achievements in ethnic work and improving lives of Khmer people in Bac Lieu over the past years. She said thanks to the Party and State’s support for ethnic groups, local socio-economic conditions have improved while Khmer people and Buddhist dignitaries and followers have made important contributions to the nation. The Vice President wished that the provincial Patriotic Clergy Solidarity Association, Buddhist monks and nuns would serve as a bridge between the Party, State and Khmer people, raise Khmer people’s awareness of the Party policies and State laws, contributing to local socio-economic development. On the occasion, she presented gifts to 10 outstanding Khmer Buddhist monks and households. Provincial authorities and the VFF chapter offered gifts to the association and Cu Lao pagoda. On April 12, Permanent Vice Secretary of the municipal Party Committee and Chairman of the provincial People’s Committee Pham Van Hieu also presented gifts to Munir Asay pagoda, Khmer Theravada Buddhism Academy, Sanvor Pothinhen pagoda, venerables and Khmer people in O Mon district.